At the recently held annual National Tourism Awards in New Delhi, Executive Chef of Jaipur’s Rambagh Palace, Chef Asish Kumar Roy, bagged the award for Best Chef for the year in India in the category 4, 5 star and 5 star deluxe category. 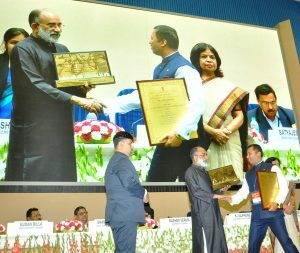 The award was given away by the Union Tourism Minister Mr. KJ Alphons and Tourism Secretary of India, Ms. Rashmi Verma at a ceremony held at the Vigyan Bhavan. It is worth noting that Chef Roy was the only awardee in this category. With a whopping 29 years of culinary experience, Chef Roy stepped in as Executive Chef of Rambagh Palace, Jaipur in 2017 for the second time. He had joined Rambagh Palace as the Executive Chef in 2008 as well. In 2012, Chef Roy also served as the Executive Chef to the then Prime Minister, Mr. Manmohan Singh at the Raj Bhawan on his visit to Jaipur. He has also earlier worked at The Gateway Hotel as well as Taj Bengal in Kolkata. Chef Roy has a TD Diploma in Cookery from IHM, Calcutta, a Certificate in Food Principle in Cookery from City Guild, London as well as a P.G. Diploma in Hotel Management. He has won numerous medals in culinary competitions and was selected as one of Ten Best Continental Chefs of Taj group of Hotels back in 2001. He was also awarded ‘Silver Hat Chef’ Award by the Indian Culinary Forum in 2008. 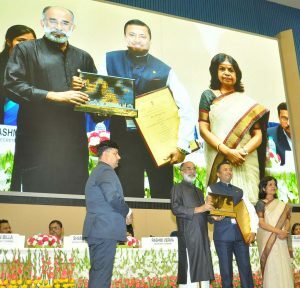 The Ministry of Tourism, Government of India presents National Tourism Awards to various segments of the travel and tourism industry every year. These awards are presented to State Governments / Union Territories, classified hotels, heritage hotels, approved travel agents, tour operators and tourist transport operators, individuals and other private organizations in recognition of their performance in their respective fields and also to encourage healthy competition with an aim to promoting tourism. The selection of the awardees is made by Committees constituted for the purpose.